With some of the best fishing, kayaking and hiking in southern Ontario, Brantford offers beautiful scenery and hometown hospitality in a city of about 95,000. Located on the Grand River and connected to Hamilton and Toronto via Highway 403, Brampton is a nice escape. It offers great opportunities to work and play, with major facilities of Procter & Gamble, SC Johnson and Ferrero confectionary company located in the city. As the hometown of hockey great Wayne Gretzky, Brantford puts emphasis on minor sports and hosts various sporting events throughout the year, giving it the nickname "Tournament Capital of Ontario." Wayne's father Walter Gretzky still lives in Brantford and is often seen at events around town. But the hockey hero isn't all Brantford is famous for. A major historical attraction in the city is the Bell Telephone Memorial, erected in honour of Alexander Graham Bell, inventor of the telephone, who lived on the outskirts of the city. Bell's home, from which he made the first phone call in 1876, is a National Historic Site. With all it offers, Brantford is calling you. 32 new job listings for this search have been found in the last calendar day, compared with 58 in the last 72 hours and 126 in the last week. The largest category under which open Brantford jobs are listed is Logistics & Warehouse Jobs, followed by Trade & Construction Jobs. 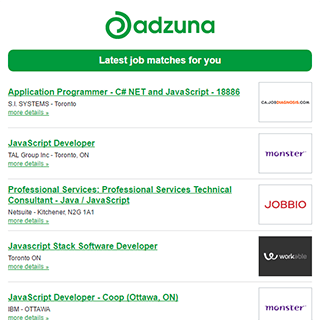 Get the latest Jobs in Brantford delivered straight to your inbox!